Hi everyone!! Happy Saturday and Happy Birthday to Taylored Expressions and Cuppie!!! My challenge today is one of my favorite kinds of challenges...a COLOR challenge! I LOVE this combo and I hope you all do as well! The colors are listed in both Prism Cardstock and the comparable SU! Cardstock colors!! CHALLENGE: Create a card using this color combination! You’re not required to use Taylored Expressions images for our challenges. KEYWORD: Upload your creation to your blog or online gallery (or both). 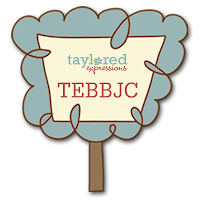 If you’re uploading to online galleries, use the keyword TEBBJC. Then come back to this challenge and leave a comment with a direct link to your creation! In order to be eligible for the prizes, you must leave a comment with a link to your card by midnight PST Wednesday, September 9th. I have two samples to share with you using this color combo! I made both of my cards holiday cards...I just love to use non-traditional colors on holiday cards!! For my first card, I stamped this SUPER sweet tree decorating cuppie from Seasons Sweetings in Memento Tuxedo Black onto Choice Buttercream Cardstock and colored him with Copic Markers. The patterned paper is a mix of Sweater Weather and Smitten Mitten, both from the new Jolly By Golly collection from Cosmo Cricket. I framed Cuppie in Rectangle Nestabilities and added piercing ALL over the card!! The ribbon is white satin ribbon that I colored with a Copic Marker and also some yummy Raspberry Twill Ribbon!! I finished this one off with some Vanilla Brads!! Easy Peasy! For my second card, I used this uber adorable cuppie from Home Sweet Home, and once again I stamped him in Memento Tuxedo Black onto Choice Buttercream Cardstock and colored him with Copic Markers. For this card, I used another Jolly By Golly pattern, Play Day. I framed Cuppies in Circle and Scallop Circle Nestabilities and added TONS of piercing again!! I finished this card off with three sugar coated brads by Doodlebug. I cannot WAIT to see what you all do with this color combo!!! Again, make sure you use the Keyword, TEBBJC when you upload!! I love the colors and your cards! They are cute and gorgeous, all at the same time. :) Just plain wonderful Jodi! Thanks for the challenge. Great colors! I found patterned paper that matched well so I've used those in my card. Great cards! I didn't have any patterned paper with those colors, but I think this works! Thanks! Loving those colors...new for me! Thanks Jodi! What a great color combination! I love both of your examples, as always, wonderful cards! Thanks for hosting a fun challenge! I combined it with Karen G's sketch. Thanks for the challenge. These cards are adorable. I love them!! The colors were hard a first but I'm very happy with the end result. Thanks for the challenge! Hi Jodi, What vibrant colours - loved your sample cards- stunning. Here is the link for my card. i stepped out of my comfort zone with this one--love the color combo! thanks! Here's my card. Thanks for the challenge.